Something a little different for Throw-Back Thursday. Can you name this animal? Dorothy ? 🙂 No, I’m afraid I have no idea. But certainly quite beautiful. It’s a Gerenuk, found in Ethiopia, Kenya and Tanzania. Member of the antelope clan, only the males have horns. I love the impala coloring, the Yoda face. It’s a Gerenuk. Cute fellow with a long neck. Isn’t is an off shoot of an impala and something else? Yes, one of the antelope clan, like the impala, with impala coloring and a Yoda face! A periscope with legs and lovely ears…a gerenuk! Yes! And I love its Yoda face. 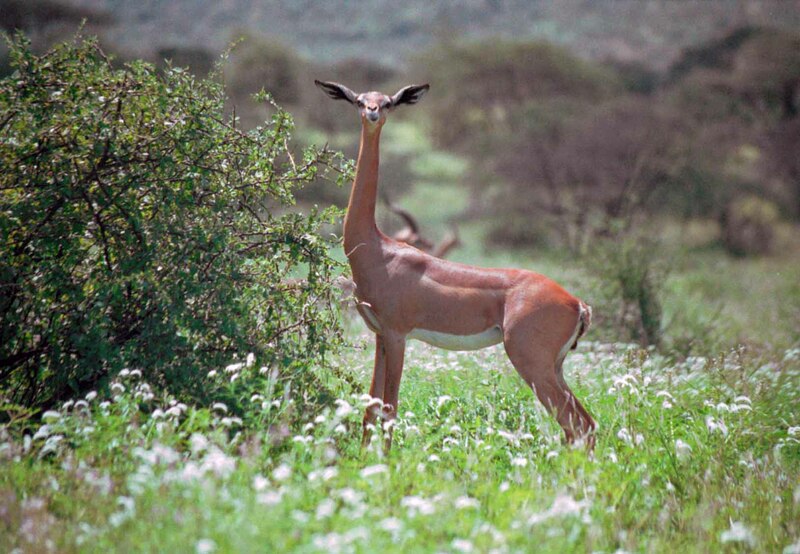 Hi Matthew – it’s a gerenuk, found in Ethiopia, Kenya and Tanzania. Member of the antelope clan, only the males have horns. Love its Yoda face. Great description – it’s a gerenuk, found in Ethiopia, Kenya and Tanzania. Only the males have horns. I love its Yoda face.